We invite you to listen to personal narratives, soundscapes and documentaries that weave through themes of identity, loss, language, love and self-determination as we broadcast the audio stories created as part of the 2018 Collaborative Radio Project. The program was first piloted in 2015 as a way for PBS to provide skills training to those feeling misrepresented, underrepresented and excluded from media spaces. The station recognised the importance in providing platforms for diverse voices to be the authors of their own stories, helping to reshape the cultural narrative into a more inclusive and accurate representation of who we are as a society. What had become obvious, however, was that for many people barriers such as time commitments, language and confidence, stood in the way of becoming regular announcers. The Collaborative Radio Project was developed in response to these challenges, facilitating the creation of pre-produced audio stories, documentaries, personal narratives and soundscapes. This year, 12 participants took part in the 6 week course, developing skills in interview technique, editing, recording, story building and structure, music, composition and effects - ultimately gaining an understanding of the ability of sound and story to conjure imagination and invite listeners to become active members in the storytelling process. 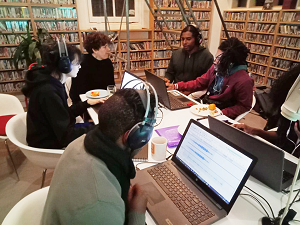 Following on from the 6 weeks, participants were teamed up with mentors to produce their own creative audio piece. The result is a collection of honest, witty, truthful and musical stories that draw on themes of migration, race, queer identity, navigating the intersecting worlds of a third culture generation, personal heroes, identity, language, love and loss. On Monday September 10, All Our Stories and Homebrew will be hosted by the program participants, who will broadcast their stories alongside music selections and conversations. The Collaborative Radio Project has been generously supported by the Victorian Multicultural Commission.